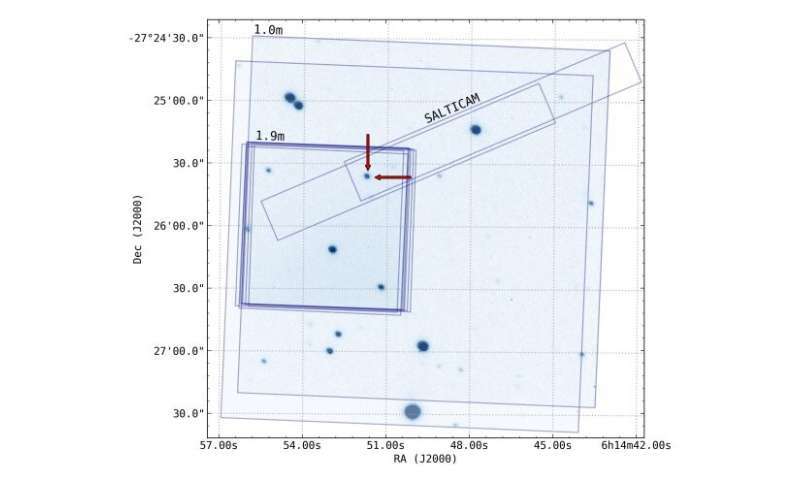 The on-sky instrument field-of-view in equatorial J2000 coordinates for the photometric data collected on MASTER OT J061451.70–272535.5 from the SAAO. Image credit: Breytenbach et al., 2019. Using the Mobile Astronomical System of Telescope-Robots (MASTER), an international team of astronomers has detected a new eclipsing cataclysmic variable. The newfound object, designated MASTER OT J061451.70–272535.5, is most likely of the polar subclass. The finding is detailed in a paper published January 9 on arXiv.org. Cataclysmic variables (CVs) are binary star systems consisting of a white dwarf and a normal star companion. They irregularly increase in brightness by a large factor, then drop back down to a quiescent state. Polars are a subclass of cataclysmic variables, distinguished from other CVs by the presence of a very strong magnetic field in their white dwarfs. Although over 140 polars have been detected to date, only 33 of them have been identified as eclipsing systems. Hence, every new addition to the still relatively short list of eclipsing polars is very important for creating a reliable sample of such objects. Building a larger database of these systems would offer astronomers more opportunities to study magnetic accretion in binaries. Now, a group of astronomers led by Hannes Breytenbach of South African Astronomical Observatory (SAAO) in Cape Town, South Africa, reports the finding of a new magnetic CV, which they believe is a synchronized polar. The discovery was made using the recently commissioned MASTER-SAAO telescope, which identified the new object as a transient source. Follow-up observations provided more insights into the nature of this source. "Here, we report on the discovery of a new eclipsing cataclysmic variable from the MASTER-SAAO optical transient survey, MASTER OT J061451.70–272535.5 (hereafter J0614–27)," the researchers wrote in the paper. The astronomers found that MASTER OT J061451.70–272535.5 eclipses with a period of 2.08 hours. The eclipse light curve of this system showcases a peculiar morphology as observations show an initial dip, where the object's brightness drops to about 50 percent of the pre-eclipse level before gradually increasing again in brightness. Afterward, the second rapid ingress is observed, where the brightness drops by around 60 to 80 percent, what is followed by a more gradual decrease to zero flux. The authors of the paper concluded that a light curve with such characteristics is result of an initial obscuration of the accretion hot-spot on the magnetic white dwarf by the accretion stream. This is followed by an eclipse of both the hot spot and the partially illuminated stream by the red dwarf donor star. According to the study, the white dwarf in the system has a radius of about 0.012 solar radii, and a mass between 0.5 and 0.86 solar masses. The red dwarf donor star is approximately five times smaller and six times less massive than our sun. The stars are separated from each other by about 3.25 AU. All in all, the researchers note that the properties of MASTER OT J061451.70–272535.5 suggest that it is a synchronized polar. "The spectral features, along with the structure of the light curve, suggest MASTER OT J061451.70–272535.5 is a new magnetic cataclysmic variable, most likely of the synchronized polar subclass," the paper reads. Given that many aspects of the nature of MASTER OT J061451.70–272535.5 remain to be investigated, especially its evolutionary status, magnetic field structure and accretion flow, the authors of the study propose further multi-wavelength observations of this system. The missing link in the evolution of magnetic cataclysmic stars?